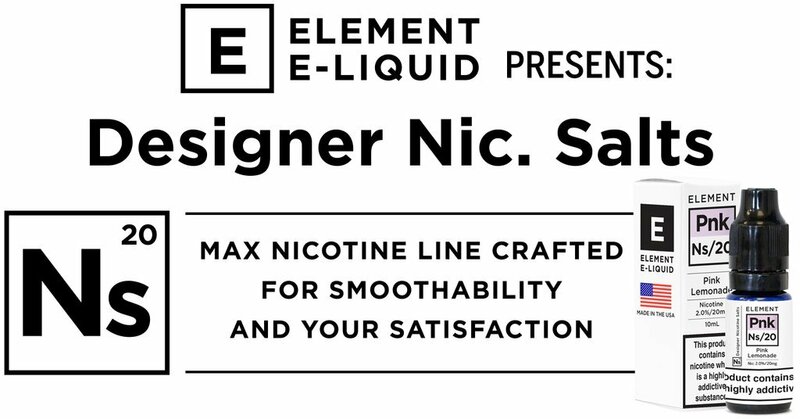 A next level vaping phenomenon, Element’s new nic salt e-liquid achieves maximum nicotine delivery with minimal hit, yielding optimum fulfillment within a smooth, flavorful vape experience. At 20mg, Ns20 offers the highest allowable nicotine content in the EU, and the quality is, shall we say, “elementally” unmistakable.Available in 14 delicious flavors spanning our Premium Dripper, FAR, Emulsions and Tobacconist lines, Ns20 brings out the best of Element E-Liquid in a premium salt nicotine vape juice. A next level vaping phenomenon, Element’s new nic salt e-liquid achieves maximum nicotine delivery with minimal hit, yielding optimum fulfillment within a smooth, flavorful vape experience. At 20mg, Ns20 offers the highest allowable nicotine content in the EU, and the quality is, shall we say, “elementally” unmistakable. Available in 14 delicious flavors spanning our Premium Dripper, FAR, Emulsions and Tobacconist lines, Ns20 brings out the best of Element E-Liquid in a premium salt nicotine vape juice.